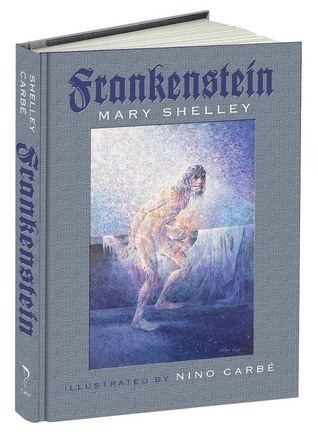 I received the new Dover edition of Frankenstein: with Illustrations by Nino Carbe written by Mary Shelley. It is being released as a hardcover with the un-Dover like price tag of $40. What is gained in this edition from free PDF versions is the proper formatting and book that is worth keeping on your shelf. Also, what makes this a worthwhile edition is the inclusion of the original drawings by Antonio Carbe from the 1932 edition of this book. The monster is drawn as more a deformed man with human emotions than a stitched-together creature. Carbe’s daughter provides the foreword for this edition with a brief biography of her father. I can’t recall how many times I watched the 1931 Frankenstein movie and Bride of Frankenstein and Frankenstein meets the Wolfman. The actual creation of the “monster” is the highpoint of the movie — The doctor and Igor in the electrical storm. The ending where we see the now stereotypical torch and pitchfork mob wanting vengeance. In the book, there is none of that. The monster’s creation is told as an after the fact story and aside from Felix and the ship’s captain Victor Frankenstein is the only living person to see the monster. No “It’s alive !! !” and no angry mobs. There have been many retellings of the story from Hollywood. Some loyal to the book others not. Even the writing of this book was made into a movie, 1986 Gothic starring Natasha Richardson as Mary Shelley. A friend hearing I was reading this book a few years ago asked me to think about something while reading. What if the monster is not real and is really a demented Victor Frankenstein? The monster does move about with perfect stealth and reads Paradise Lost (which becomes an important theme), Goethe, and Plutarch, quite an accomplishment for a non-speaking, at the time, illiterate monster. Victor is also ill and his illness follows the deaths of his family and friends. Perhaps man is the ultimate monster, but there is so much literary history behind the commonly held beliefs of the story. Maybe it’s time to pick up a new, old book and look at the story from a different angle. Discover something new. Relive a bit of your childhood and see how the movie versions of your favorite Universal Studios’ monster holds up to the original text. Yes, it is a monster book, but it is also a classic. It is the best of both worlds.